I'm giving some gift cards for Christmas this year, and wanted to make the presentation a little more special than the standard foler. I decided to make my own boxes from greeting cards. I found some instructions on line, but they made no, or poor sense, so I just made my own. 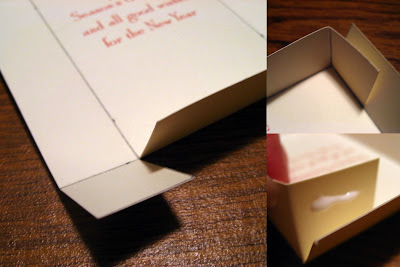 • Determine the size you want the inside of your box to be, minimum for a gift card should be 2 ½ x 3 ¾. • Add 2 inches to each dimension, minimum = 4 ½ x 5 ¾. 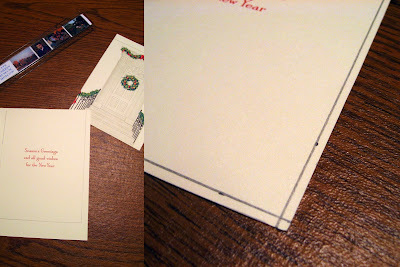 Consider the design of the card you’re using and make any adjustment. The card I used worked best if I increased the dimensions to 4 ¾ x 6 ½. • Cut card along fold. 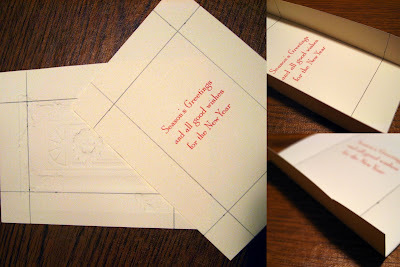 • Cut top and bottom of card to size; center your design for top, and greeting for bottom, if possible. • Trim 1/8 inch from one side and one end of box bottom. • Use a ruler to draw pencil (fold) lines 1 inch from all the edges – for the box top, draw on the back, for the box bottom draw on the greeting side. • Fold up the sides, along pencil lines. • Fold up the ends, along pencil lines. • Cut along both pencil lines, on the ends, just to the fold mark. • Put sides and ends into position, tucking side flaps behind ends, dap a spot of glue, attach to end side; hold until dry with paper clip. Pretty cool...I like it. Might jsut have to give it a try. 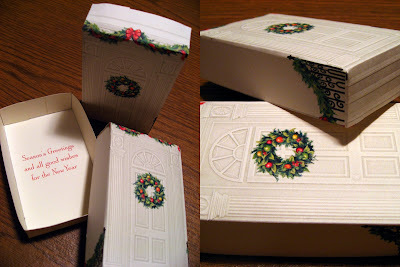 It makes sense to me, but one of my very favorite things to do with stamping is make boxes. I am VERY impressed you figured this out with poor instructions. You have a talent. Sometimes when I show people, step-by-step, they don't get it at all. Measuring and fractions throw a lot of people off. That 1/8" difference is key, and some just can't figure that out! Very creative, Jan ... I make our holiday cards .. I should be getting my rear in gear and finding the appropriate photo ... I also make my own gift name tags .. I dont think I am giving any gift cards BUT if I do this is definitely the classy way to do it! Those are lovely, but don't they get squashed in the post? I guess you only give them to people you can hand them to? They actually look fun to make and they're very pretty!